best nerd meld all day - EXCELSIOR, YOU FATHEAD! My pal dskasak has found a Doctor Who alignment chart (in fine Motivator fashion, mind you) and I gotta say I have no arguments about this one whatsoever. IT TELLS IT LIKE IT IS, MAN. How can Colin Baker possibly *not* be Chaotic? And Tennant seems much more Neutral to me. And I just, somehow, pictured this chart as a back allignment thing. Nerdfail here. I have to say that it makes sense only in the realm of "compared to each other." I mean, none of them is any farther down-right than Hartnell's right ear in that pic. 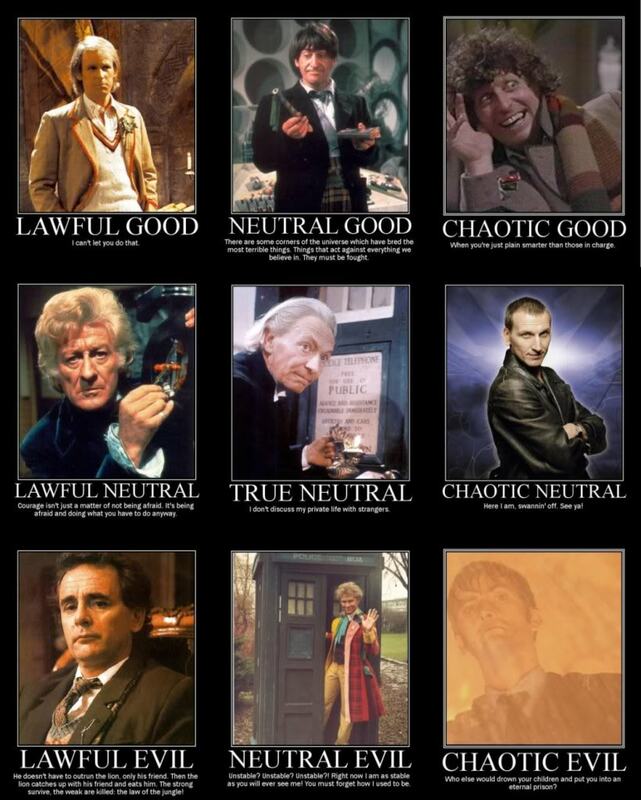 And the need to fill all nine boxes creates some anomalies; I'd say only the Pertwee Doctor and *maybe* Davison really falls in the Lawful column, and the Hartnell Doctor should be comparatively further in the Evil direction. And then there's McGann, about whom there isn't enough material to say unless you count tie-in media as canonical.